American Accent Training - A Guide to Speaking and Pronouncing American English - Smith.N Studio! 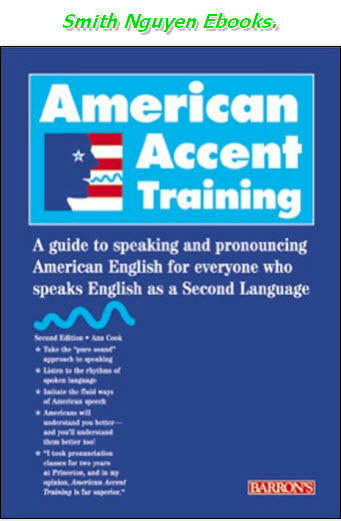 * E-book: American Accent Training - A Guide to Speaking and Pronouncing American English - Smith.N Studio! * Dung lượng: 5CD + Ebook. * Upload: Smith Nguyen Studio. * Giới thiệu: Smith Nguyen Ebooks. Average Customer Review: Based on 29 review(s). The second edition of the highly acclaimed American Accent Training, now on 5 audio CDs, is for foreign-born students and business people working, traveling or studying in the United States and Canada. Through extensive intonation and pronunciation exercises, students learn how to speak with a standard American Accent. At the same time, listening comprehension improves dramatically. Supplementary materials included detailed nationality guides for eight languages (Chinese, Japanese, Indian, Spanish, French, German, Russian and Korean), access to a comprehensive website, and referral to a qualified telephone analyst for an individual diagnostic speech analysis. Also included are colored markers for written exercises, and a mirror to practice accurate pronunciation. Quyển này rất hưu dụng cho các bạn muốn luyện nói của mình cho giống người mỹ!! !